More and more lately, I have been finding myself with smaller and smaller purses on the weekends. The big purses leave a harsh red mark on my shoulder because they are way more heavy than necessary. I carry around a million and one things I never need and tend to forget the small things that are a total necessity. Here are some of the itty bitty items that I have been carrying around on my jets out to grab coffee, brunch or do a quick shopping trip on my few days off. 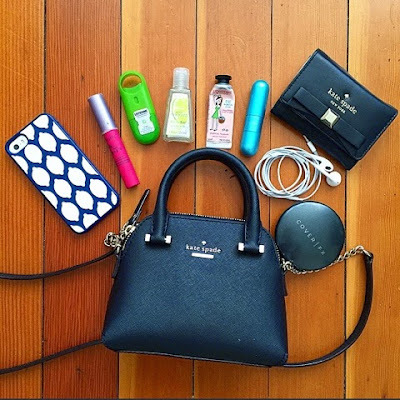 Kate Spade Mini Maise – I’ve realized that, for myself, a small purse has to be multifunctional. It needs to be both fashionable and functional for be to be completely smitten with it and this Mini Maise totally fits the bill. It is a mini bag in nature, but as a cross body bag with a lot of space, it packs a wallop of a punch. I have been totally obsessed with since I picked it up in late December and I don’t see myself putting it down anytime soon. Since I got it in black, it goes with practically every outfit I own and with the tiny top handles, it is just so darn adorable. It also does a great job of holding my iPhone 5s with its cute little lemony Kate Spade case. Tarte Matte Lip Tint – The past week or so, it has been gloriously warm for February, mid 70’s or so, and I have been taking full advantage by pulling out some of my Spring/Summer favorites, including this bright pink lipstick from Tarte. Lipstick touch-ups are a necessity for the in-between on the weekends and this lipstick is perfect for that. It smells like mint, feels like lip balm and has a gorgeous hot pink shade with big staying power. It practically screams Spring and warm weather. Listerine Pocketmist – I have this weird thing about coffee breath. I absolutely love the taste of coffee and find it necessary for my everyday, but I can not STAND the aftertaste when I finish a cup. I have been on the receiving end of coffee breath and it is just absolutely horrid. I have become determined to never be that person and this Listerine Pocketmist definitely helps with that. One quick spray and I am clear and free with fresh breath and a smile on my face. It is an absolute purse necessity. Island Margarita Pocketbac – I touch a million and one things when I am out and about and I know I can’t wash my hands as often as I need to so that is where this little pocketbac comes in handy. With the delicious scent of a fresh margarita, this hand sanitizer keeps me fresh and clean throughout my day. Plus, it smells really amazing. L’Occitane Hand Cream -To follow up with the hand sanitizer, you definitely need a mini purse hand cream and I think that L’Occitane makes some of the absolute BEST hand creams. They are compact, smell amazing and do the job better than you ever thought a hand cream could. Whether you are meeting old friends or new acquaintances, a silky smooth handshake is always best. Sephora Universal Atomizer – Another on the go necessity is this small atomizer from Sephora! I spray in a small amount from my big 5 oz Chance by Chanel bottle to always have a bit of my signature scent on the go. It’s the prefect size for freshening up. Kate Spade Darla Wallet (old, similar) – I love this little teeny wallet. The soft leather and front bow completely scream Kate Spade and totally show off my sense of style. I always love a well placed bow and this wallet make me smile every time. Cover FX Mineral Foundation – For us oily, shiny faced girls, a powder compact is an absolute must for on the go. This compact is my favorite by far! It is built for sensitive, acne-prone individuals like myself and goes on like a dream. I am never embarrassed to go ‘powder my nose’ with this compact. Have some ‘On the Go’ favorite of your own? Share them with me in the comments below! The mini maise gets all the heart eyes! You're so right, i need both fashion and function when it comes to my purses and I love Kate spade everything! I love all of this – I wish we could get them in the UK! Love your Kate Spade purse so much!! I love that purse! I've been debating buying it for so long, thanks for sharing!! So jealous of your Kate Spade bag and wallet. I always have to have chapstick with me! I have always had my eyes set on that specific Kate Spade bag. But I never went through with my purchase (because I usually go for more supple soft leathers rather than the one like your purse is). But I think it's so gorgeous. I love that wallet! Kate Spade always has the cutest details. And I'm going to check out the Tarte lipgloss!! So adorable! I always have a travel set of things to go, I work in San Francisco and don't want to lug around my whole bag. Love the Kate Spade purse. What a cute bag! Love your essentials choices. That Cover FX compact seems like something I need to try!